ItemI-51981 - Albert Hatherly Maynard; from Box 9, File 299. ItemI-50662 - Indians on board HMS Boxer; from Maynard notes; 5 x 7 stereo wet plate; from Newcombe Collection, box 7.16, stereo view. ItemI-51982 - Old Custom House, securing licences for gold mining in the Yukon; box 13, file 420. ItemI-51983 - Indian hunting party at oceanside; it appears to be a duck or goose shoot, with the women cleaning the birds as they come down; box 44, file 1287. Item I-51983 - Indian hunting party at oceanside; it appears to be a duck or goose shoot, with the women cleaning the birds as they come down; box 44, file 1287. 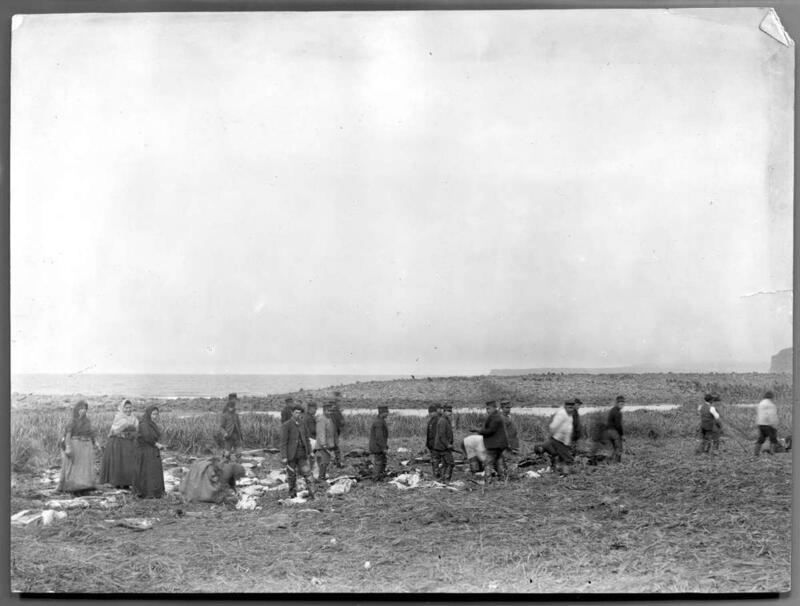 Indian hunting party at oceanside; it appears to be a duck or goose shoot, with the women cleaning the birds as they come down; box 44, file 1287.